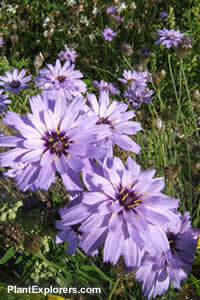 Short-lived, cornflower-like perennial with clumps of linear, grass-like hairy leaves up to 12 inches long. In mid-summer to autumn, bears blue to lilac-blue flowerheads 2 inches across, with darker centers. Combines well with echinacea, grasses and hemerocallis. This plant is now in the Compositae family. For maximum freshness, please keep seed refrigerated in its original packaging until it is time to plant. Sow seed in containers in a cold frame in early spring or in situ in mid-spring. Grow in any well-drained soil in full sun. Best treated as an annual.